I wanted to start a project called Project Hoss. It’s about a new truck that we purchased to work here at the house. New to me that is. 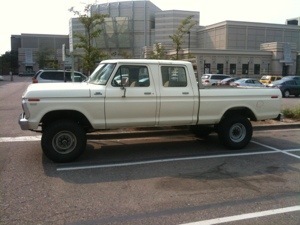 It’s a 1977 Ford Crew Cab. Because we have six kids I needed something with extra space so the crew cab was essential for a work truck for me. It comes with a 351 modified engine, four-speed transmission, four-wheel-drive, short wheelbase. Follow along as I modify this truck for my needs here at the house. Not sure exactly everything I’ll be doing to it but just to give you an idea it will have a winch bumper, working on board air compressor system, and also have radio communication such as a CB radio and ham. This is been one of those trucks I’ve wanted for very long time finding a crew cab in this model year is extremely hard let alone a short wheelbase crew cab so I’m really excited to tackle this project.